Merry Christmas! Head outside and take in a Sky Show Tonight! I wish you all a safe and happy holiday, with lots of good geeky fun (and maybe some tech under the tree). While you're hanging with the family tonight, why not take a few minutes to head outdoors and take in a spectacular show up in the sky? Yes, tonight Jupiter and the moon will be making an appearance together, brightly lit like Christmas lights. 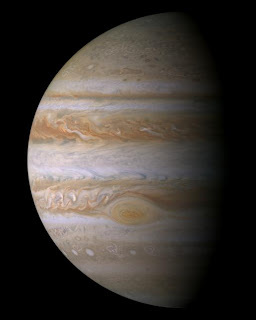 And no, you won't need to be out in the country to see it; Jupiter will be visible to the naked eye in urban areas too. And if you have a telescope (or just got one for Christmas), take it out with you so you can get a close-up of the storms, especially the eye which will be especially visible. According to the report from Nasa below, that storm has been evolving and changing shape over time. The show starts when the sun goes down, so when you're done dinner, grab a coat and head outside to (as Nasa puts it) check out the Christmas lights.